This image gave me a start when I came across it in my old notebook. Kylan, the guy I had a crush on my freshman year, ended up marrying his high school sweetheart and joining the navy. He was killed in Iraq in 2003. He was incredibly smart as well as just an all around good guy. The world is a better place for his having lived, and I know his family and friends miss him terribly. 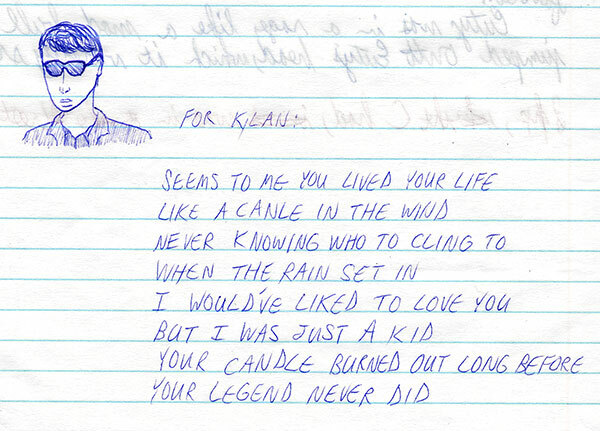 I don't know why I decided to write the lyrics from "Candle in the Wind" next to his picture all those years ago, but it seems sort of appropriate now.